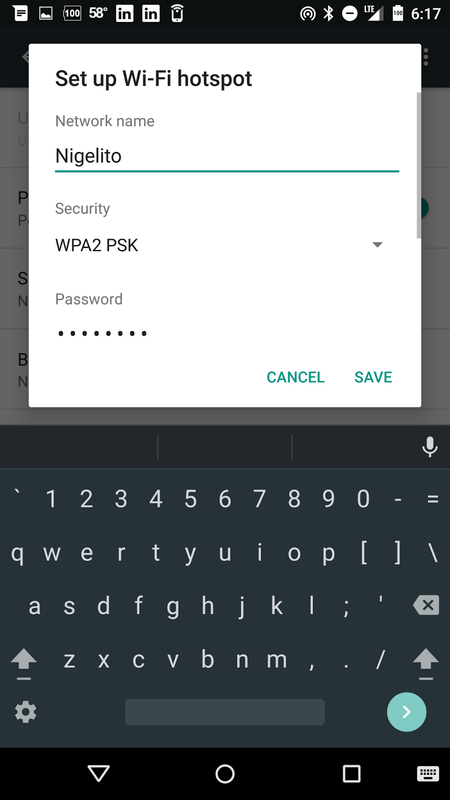 Unlike some other carriers, Project Fi allows you to use your phone to create a Wifi hotspot so other devices can tether to it for no extra charge. Once you set it up you will be able to share your data connection with any device you want. Setup is simple. All you need to do is go into the device settings, and select Wireless Networks. In that section choose More, and then Tethering & Portable Hotspot. Turn the switch on, and then select Setup WiFi Hotspot. 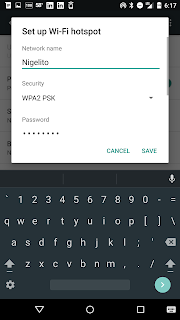 Enter Network Name, Security type and the password. Once this is all completed you will see the HotSpot Icon in your notification shade. Now just go to your other device, find the network as you normailly would, enter the password, and you are now connected. The nice part about Tethering with Project Fi, is you can see how much of daily data usage is used by tethering. You can do this in both the Project Fi app and at fi.google.com and viewing the daily usage under the account tab. In addition to WiFi tethering, the N6 has the ability to provide bluetooth tethering and USB tethering. I will cover these topics in separate posts. Hello Scott, Thanks for providing such good detail on WiFi tethering. I wanted to point out something that I encountered that may help others. 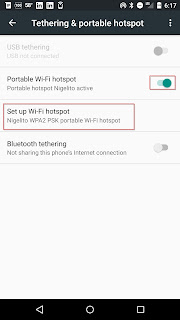 Using my Nexus 6p and Project Fi, I set up tethering and then wen to my other Verizon cell hone and connected to it. However, I found I could not get access to and Internet sites. 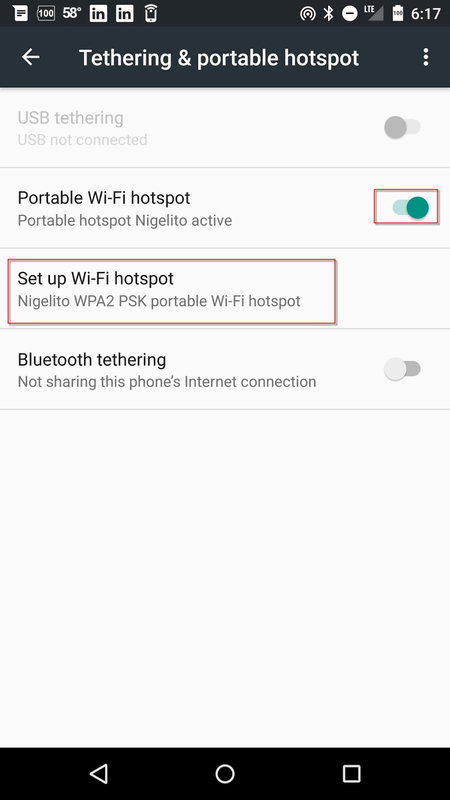 I found that tethering did not work if my Project Fi was connected to my home wireless. I suspect one has to be connected to a mobile network for tethering to work. I'll try it again when I'm in a mobile network. I know, someone must be thinking, why would you do that - connect via tethering when you home WiFi network is active. The answer is - I was testing tethering set up on my Nexus 6P. Also, I noticed that when I first set tethering up, my home WiFi died. I had to reset the DSL modem. Not sure if that was just coincidence or what. 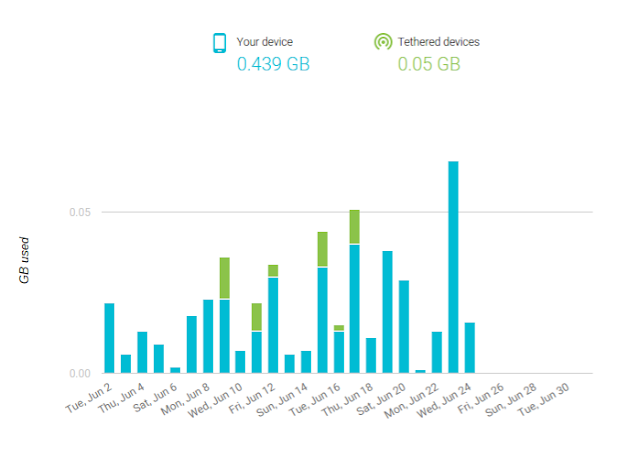 More testing may tell me if turning on tethering in my home WiFi area creates a conflict or not. Well there is a good reason to tether when Fi phone is on wifi, because of the VPN. Not that it is necessary at home but it would provide à level of comfort when using public wifi.